Welcome to the fabulous Saint-Petersburg! Saint-Petersburg, “City on the banks of Neva River”, “The Northern Capital of Russia”, “Northern Palmyra”, “The Venice of the North”, or, simply Piter – there is so many names of this beautiful city. Tourists from all over Russia, and from all over the world come to St. Petersburg to discover it and admire it’s endless beauty. 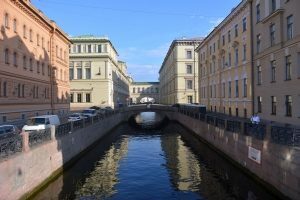 Saint-Petersburg leaves no one indifferent: it is a city-fairytale, city of dreams, the city that is proving the greatness of Russia, the most “European” russian city. Saint-Petersburg is not like other cities – it was created on a wild place by the mighty will of the great ruler of Russia, it was intended to become a majestic city from it’s very beginning. Saint-Petersburg is keeping the history of our country in it’s every stone. So many artists, poets, writers, composers, sculptors and architects were inspired by Saint-Petersburg! There are countless works of art, the masterpieces that are tributes to this beautiful city. Let us walk through it’s streets and squares and see the magnificent creations of artists and architects, praising the Saint-Petersburg.